Cape Town is famous for its incredible beaches. Those on the eastern side of the Cape Peninsula bordering on False bay are known as swimming beaches because of the warmer waters on that coastline. The beaches on the western side of the Peninsula are known as beaches used mainly for tanning as they are sheltered from the strong south east winds which blow in summer. The ice cold Benguela current flowing northwards up the Atlantic coastline turns the water at these beaches cold and makes swimming unpleasant. Nevertheless all the beaches are beautiful and well worth a visit. To market the various beaches in and around Cape Town a number of beaches are given blue flag status for the summer season and so attract more people to them. When deciding where to go, visitors should look out for the Blue Flag beaches because they have specifically been selected for their high standards of beach management. The public visiting these beaches are guaranteed that lifeguards will be on duty every day during Blue Flag season which runs from December to March. For the 2011/2012 summer season eight beaches in Cape Town have been given Blue Flag status. Clifton 4th Beach, Llandudno and Silwerstroomstrand. As it happens four of these beaches are situated on the False Bay coastline while the other four are on the Atlantic coastline. Bikini beach is the first beach listed and is situated at Gordons Bay on the eastern shore of False bay close to the eastern of the Gordons Bay Harbour. The beach is known for its cleanliness and is sheltered from the wind. It is very popular with students for sunbathing, surfing swimming and socialising. The harbour wall to the right of the beach is also a well known fishing spot for kabeljou, sharks and other varieties of fish. The beach is sandy and steeper than most other beaches in and around the city dropping off into deep water quite quickly after entering the water. The waves are larger than other beaches in the vicinity and are known as dumpers as they tend to curl and dump one on the beach. 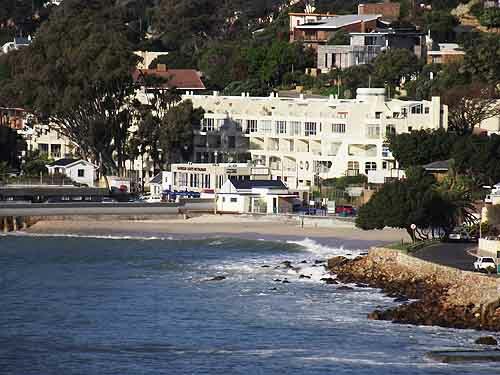 Gordons Bay village nearby is a popular holiday destination during the summer months. Moving west along the False Bay coastline the next blue flag beach is Mnandi beach. The only blue flag beach along this coastline with an African name. 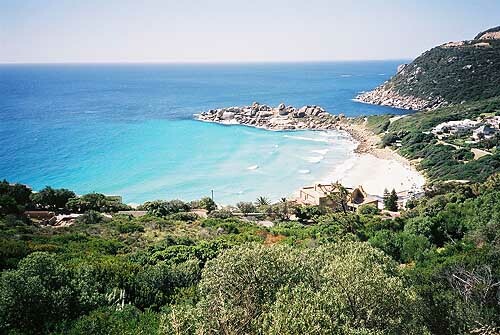 Mnandi is one of two or three beaches along this coastline which are accessible to the townships of the Western Cape. The name Mnandi means “ lovely, just right”. This beach is a day resort which has a freshwater pool with water slides, lawns picnic tables, braai sites and a playground for the kids. It also has a safe stretch of beach with white sand and warm water to swim in. Life guards are on duty between December and March. The resort was built especially for black people during the apartheid era and but since 1994 has been open to all races. This resort was first granted Blue flag status in 2003 and it status has been renewed every year since then. 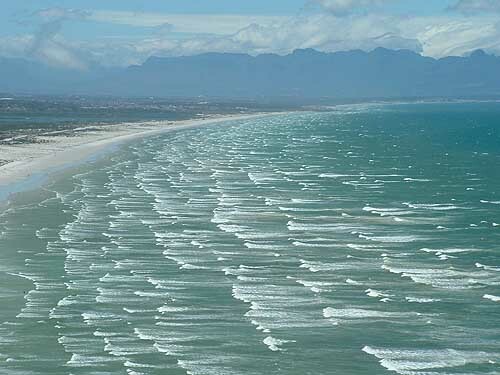 The next beach on this coastline to have blue flag status is Strandfontein. This beach is marketed as a day resort and has an exceptionally large tidal swimming pool with sandy beaches on each side of the pool. Other than the pool it has grassed terraces, a pavilion and a picnic area with facilities to braai in. Lifeguards are on duty during the blue flag season starting in December until the 31st of March as well as during peak times during the summer season. The National Sea Rescue Institute has its Station 16 situated at Strandfontein and is on hand to carry out sea rescues all along the Muizenberg to Gordon's Bay coastline. The beaches along the Strandfontein coastline are well known for their angling and people visit the area from all over South Africa to try their luck. A word of warning however, do not go and fish on these beaches on your own. 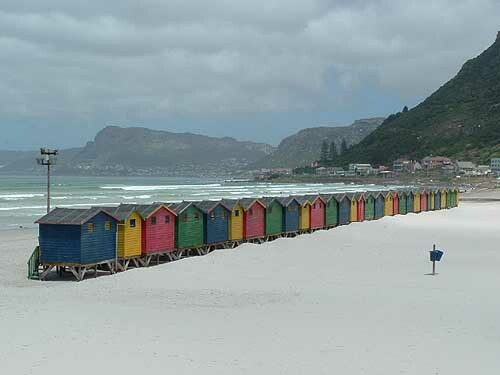 The biggest and most well known blue flag beach on the False Bay coastline is Muizenberg beach. It not only caters for swimmers but surfers as well. In the summer months it gets blown out by the strong south east winds known as the Cape Doctor and if swimmers and surfers do not obey warnings from the shark spotters they could have their toes nibbled off by the great white sharks that patrol the coastline looking for food. The beaches are safe with no deep drop offs and the area has some unique features. This is the only blue flag beach that one can get to by train. All the others need a vehicle of some sort to get to. 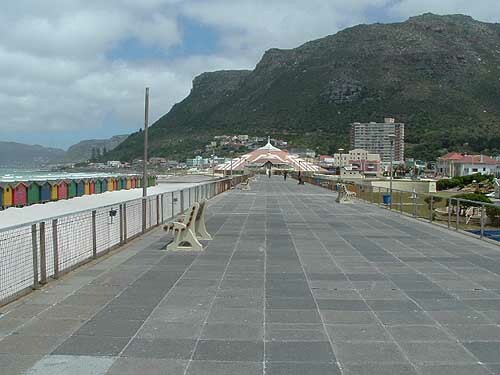 Muizenberg beach has a pavilion which can be used for conferences weddings etc, and also has a raised promenade which is about a kilometre in length. 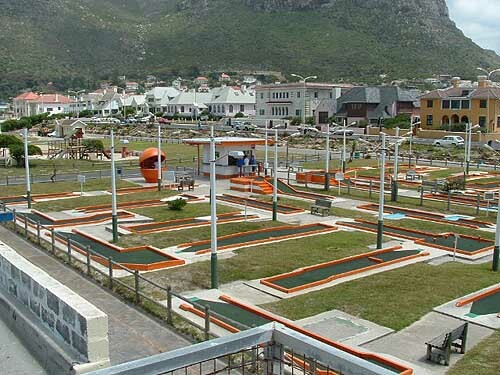 A recreational park which has a putt putt golf course and a water slide is built on the lee side of the promenade. On the beach are a row of colourful beach huts which date back to 1910 and which today form the southern boundary of a sandy area known as the snake pit where sun worshippers lie and tan out of the wind. From Muizenberg we move west across the Cape Peninsula and the Table Mountain range of mountains to Llandudno which is the most southerly beach on the Atlantic coastline with a blue flag status this year. Finding this beach and a parking spot to park in it can be a problem in the peak season. The turnoff into Llandudno is situated on Victoria drive about 300 hundred metres before the Suikerbossie restaurant turnoff on Hout Bay hill. From the turnoff the road winds downhill to a very small parking area close to the beach. In season you need to get there early to get your spot. The beach is pretty interesting in that one has to walk through a Milkwood tree forest to get to the beach. Another interesting feature are the granite boulders on both sides of the beach which provide shelter from the wind and have a number of caves in them. The seawater on this beach is very cold, normally between 10 and 15 degrees centigrade so you will usually find only the odd bather swimming. Hardy surfers in wetsuits surfing the waves that break into the bay are most probably the only other people you will find in the water. The beach is protected by the voluntary Llandudno Surf Lifesaving Club during the blue flag period. Dogs are not allowed on this beach between 9.00 am and 18.00 pm. 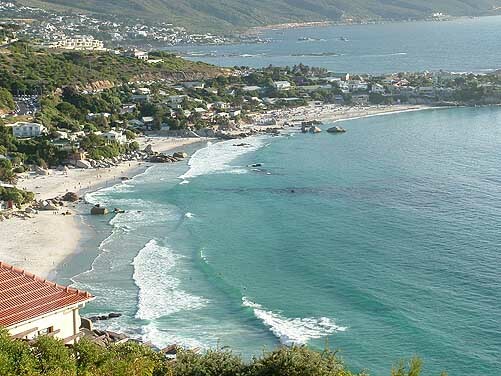 Camps Bay Beach is the next blue flag beach on the Atlantic coastline and can be found in the area known as the Cape Town Riviera. The sea in the summer months is always a beautiful turquoise blue colour while the beach is pristine white sand. The water at Camps Bay is very cold and the sea has a bit of a rip tide so people have to be careful when swimming here. On the eastern side of Victoria road which runs through Camps Bay to the south you will find a whole bevy of interesting restaurants and hotels as well as holiday accommodation. Parking is at a premium for the whole of the summer season so if you intend visiting the beach get there early. Being a family orientated beach Camps Bay also provides a sea water swimming pool which allows safe swimming for children. Lifeguards are on duty during the peak blue flag season. The next and very popular beach for the trendy crowd is Clifton 4th beach. 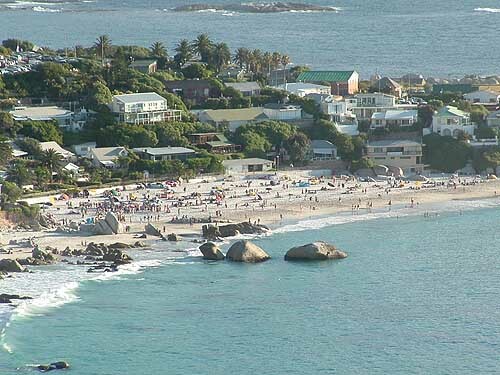 Clifton has four beaches numbered one to four with the firstbeach being the most northerly beach of the four. The beaches are separated by granite boulders and during the summer months the yachting fraternity sail their yachts into the bay and anchor them in the sheltered waters of the bay. 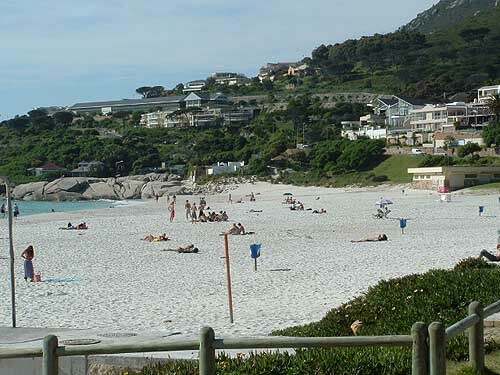 Clifton beaches are primarily used for tanning and showing off beautifully sculpted bodies. They are more sheltered than Camps bay where the water is also pretty cold so not too many people actually swim in it. Those who have burnt themselves to a cinder in the sun or have being playing beach bats on the beach jump in to cool off for a couple of seconds before once again warming themselves in the sun. There is plenty of parking available along Victoria Road for the Clifton beaches although one should get there early to secure a spot. People visiting these beaches should take everything they need with them for the day as the climb down the stairs to the beaches can be quite daunting depending on which beach you are visiting. The last of the blue flag beaches for this season is a beach on the west coast which is not too well known amongst the normal beach goers of Cape Town. It's called Silwerstroomstrand and is named after a stream that rises from an acquifier that is found on the edge of the Atlantis dunefield near Atlantis. 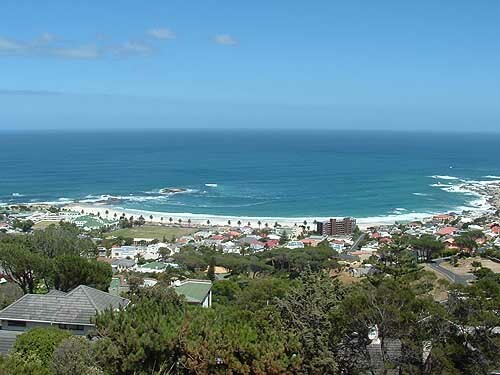 This coastal resort is situated about 10 kilometres from the the West Coast road and about 50 kilometres from Cape Town. The resort is used mainly by the residents of the two small inland towns of Mamre and Atlantis. The resort has a salt water tidal pool and a protected beach where people can swim in the waves. For day visitors picnic sites with braai facilities have been laid on and for those who would like to stay for a few days there are bungalows to hire and a caravan park. Angling off the beach is good during January and February when the Hottentot come on the bite. A slipway has also been provided for those who would like to go to sea to catch crayfish. The beach is protected by lifeguards during the blue flag season but unfortunately this year there was an accident and some one drowned when he was pulled out to sea in a backwash. The bay has a three kilometre sandy beach which those who enjoy walking can use. The northern half of the beach is backed by huge sand dunes while the southern end has been earmarked as a potential core area for the Western Cape Biosphere Reserve. The area is well known for its bird life while the dunes are covered with strandveld vegetation which flower in early spring bringing the area to life. As you can see, all the beaches have their own unique features and should you choose to visit all of them you will experience many diverse cultures as many of the beaches were originally built for specific race groups during the apartheid era. Although they are all open to the general public many of the people who originally used them still do so today. It's an ideal opportunity to see how the various peoples of Cape Town relax and do things. In some instances it may be an eye opener for the uniniated.